This neighborhood is home to pets, children, and wheelchair bound people. As previously reported, traffic comes flying down this dead end road. A study was supposed to have been done last year but nothing has changed. Is there any chance to at least get speed limit signs posted if not speedbumps? This concern was assessed in July 2018 SR10304 and it was determined by Public Works Traffic Engineer Jeff Gordon that due to the moratorium on the install of new traffic calming devices by the City Commission's office that this office would not be able to install speed calming devices as requested. It was further determined that the area is properly signed. Consequently this request was turned over to the Gainesville Police Department for further assistance with speeders. If you desire please contact the office for Captain Campos at 393-7784 regarding this matter. Thank you for using 311GNV. New Plumbing sewer piping on exterior of house not permitted or properly licensed. The dead tree could fall on neighbors house causing severe damage. The tree has been dead for at least 6+ months. The Public Works Department is in receipt of the "Dead Tree/Limbs" issue at "NW 3322 25th terrace , Gainesville, Florida". We have created service request #14207 to be investigated by our Operations Division. If you would like to speak directly with someone in this office, please call 352-334-5070. 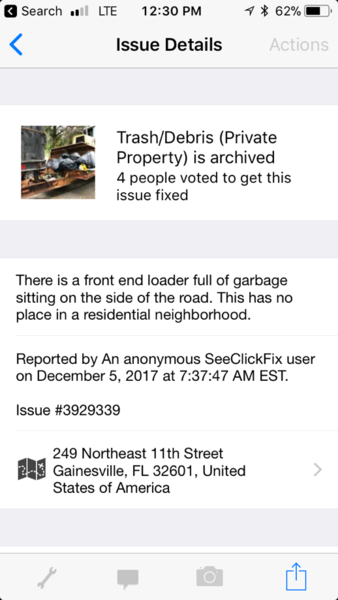 Thank you for using 311GNV to bring this issue to the city’s attention! Upon further investigation it has been determined that the tree in question is located on private property. Consequently we have referred this request to PW Arborist Matthew Mears to assess and determine the state of the tree. Mr Mears will notify you of his findings. Tree was hit by a car and cut down last year. Could it please be replaced with a new tree? Located on northbound side of NE Waldo Rd., just north of NE 3rd Ave. This request is pending in Public Works system. Please reference SR12905 when seeking an update from Public Works on the status. Hey, thanks for drawing attention to this issue. I assessed site on 7/27/2018 and this site is on list for planting. Tree was hit by a car last year and cut down. Could it please be replaced? Located on northbound side of NE Waldo Rd., just northeast of Episcopal Children's Services (across from it). Photo of different vantage point. Run-over tree location is at bottom-left Of photo. This request is pending in Public Works system. Please reference SR12692 when seeking an update from Public Works on the status. Tree was crushed by larger fallen tree and cut down after hurricane last year. Could a replacement tree please be planted? Located across from UF Health & Family Medicine on northbound side of NE Waldo Rd. This request is pending in Public Works system. Please reference SR12682 when seeking an update from Public Works on the status. Hey, thanks for drawing attention to this issue. I assessed site on 7/27/2018 and saw the need for a replacement tree. This site is on list for planting. Tree in foreground seems dead. One behind it seems like it's struggling. Could the health of these please be assessed, and new trees be planted if necessary? Located along Waldo Greenway bike trail just south of NE Waldo Rd. and NE 12th St. intersection. This request is pending in Public Works system. Please reference SR12680 when seeking an update from Public Works on the status. Hey, thanks for drawing attention to this issue. I assessed site on 7/27/2018 and saw the need for two replacement trees. This site is on list for planting. Could these two dead/diseased trees please be removed and replaced with different trees? Located on northwest side of NE Waldo Rd. in front of Labor Finders building. This request is pending in Public Works system. Please reference SR12678 when seeking an update from Public Works on the status.